The water mist of these fire extinguishing systems already exerts its effect on flames and smoke columns. Faster evaporation leads to cooling of the environment and oxygen displacement that puts out the fire quickly and reliably. On the one hand people receive special protection because the water mist absorbs the heat radiation and flue gas. On the other sensitive assets benefit from this extinguishing method, which uses far less water than conventional sprinkler systems. The low-pressure technology offers high value for money and is suitable for in particular retrofitting due to the small tube diameter. Water mist extinguishing systems with high pressure technology are used wherever an extinguishing system must have high performance. Evaporation draws in the fire energy and leads to the extinction of the flame. Evaporation leads to the formation of fire retardant oxygen displacement. The water mist lowers the concentration of combustible gases in the fire. The high particle density shields the radiation heat (separating effect) and hinders the combustion of flue gases. The cooling effect of evaporation is thus already set in the wider area of the fire source and protects people and assets. Compared to traditional sprinkler systems (according to VdS CEA 4001) they use up to 85% less water. The water supply and units in the sprinkler centre can generally be much more compact than before. This saves space and therefore on-site costs. Due to the expected lower requirements for electrical power and extinguishing fire water, significantly lower costs are incurred for connections to the electricity and water supply networks – both for one-off and ongoing costs. When connected to emergency power there can be cost savings if existing replacement power systems are used (e.g. for lifts) instead of a diesel pump. Much smaller pipe diameters result in significant space savings for pipeline routes, especially in suspended ceilings. In the case of high rise buildings, an additional floor can be realized under certain circumstances. Low-pressure water mist fire extinguishing systems (also called fine spray extinguishing systems) are fire extinguishers that spray a fine mist of water in continuous or intermittent operation. In the case of conventional sprinkler systems the extinguishing effect is mainly due to the cooling effect of the larger water droplets on the surface of the object that is on fire. 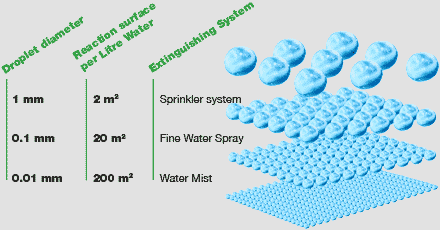 Water mist fire extinguishing systems use a much larger surface area of fine water droplets in the area around the fire. 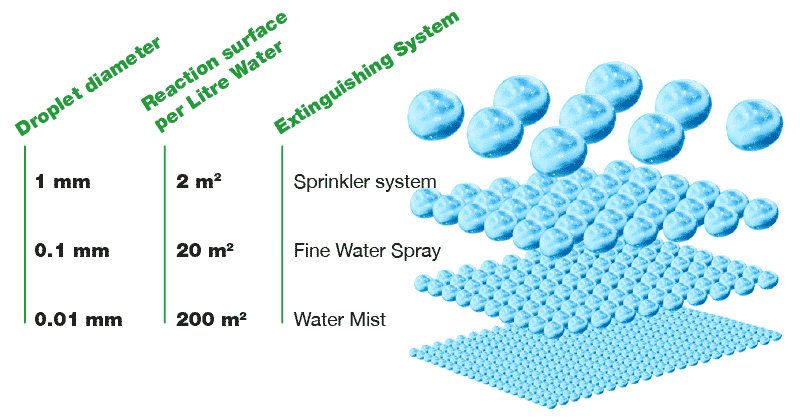 Even without extinguishing agents the water mist fire extinguishing system has advantages in the quenching effect on flame fires, particularly for liquid flammables and burning droplet thermoplastics. At the same time it has the advantage of much lower extinguishing water consumption. The systems can be used independently with all kinds of quick release items such as glass barrels or fire detectors. It is possible here to trigger individual spray heads as well as to trigger groups of spray pipes arranged on spray heads. Fine spray extinguishing systems are characterized by good value for money and are suitable in particular for retrofitting due to the low pipe diameter. 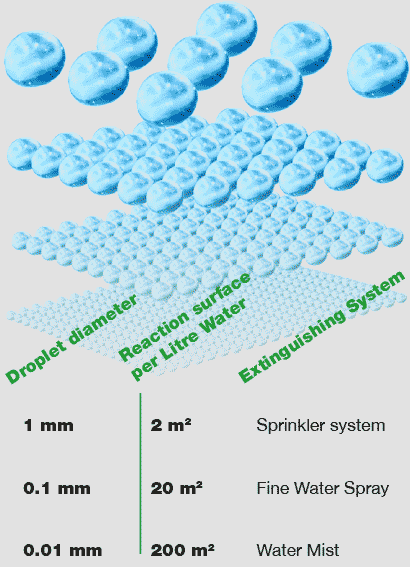 Higher reliability, since the fine spray sprinklers at low pressures have significantly larger outflow cross-sections than for high pressures and thus clogging due to dirt is virtually eliminated. 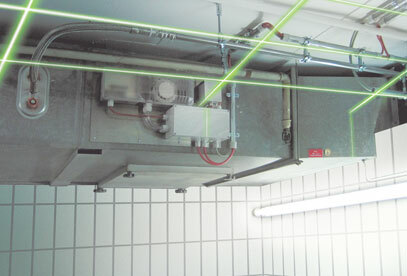 Significantly lower equipment costs, as high-pressure water mist fire extinguishing systems require the provision of extinguishing water at high pressure and, in order to compensate for the small outflow cross-sections, expensive units and special components, as well as pipe and fittings are made of stainless steel. Due to the low operating pressure, a fire brigade feed and in many cases also a connection with a traditional sprinkler system or a mains water system can also be provided. A particular water quality level is not required for EconAqua™. A common water supply can be provided for conventional indoor hydrant systems and EconAqua™ because the two systems have similar pressures. Significantly lower maintenance expenses, because as a result of the higher operating safety, the plant cannot be constantly checked for clogging etc. ; when parts are exchanged low-cost components for low-pressure technology can be used. As an automatic shut-off, fire dampers prevent fire and smoke from spreading through the ventilation duct bilaterally connected to the flap. Fire dampers in existing buildings that were built before 1988 must be adapted to the current requirements. A low-cost renovation measure is often sufficient for this. EconAqua™ is a development based on traditional sprinkler systems. 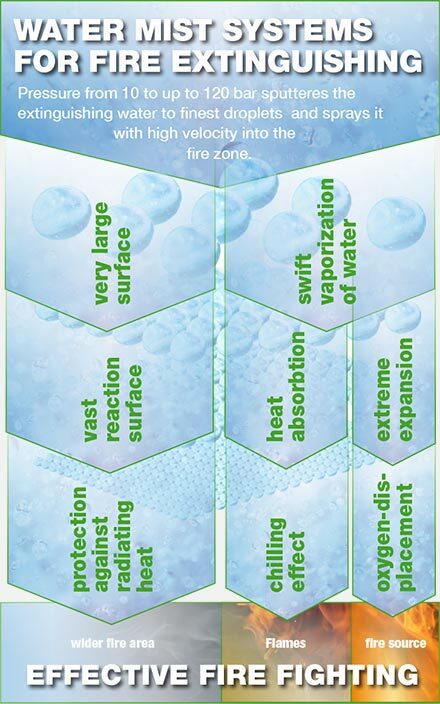 By using innovative low-pressure water mist technology, the system provides extremely efficient building protection for particular risks under VdS CEA 4001. EconAqua™ protects people, property and the environment through effective fire fighting. In addition, the customer can meet regulatory requirements with the system, for example, to obtain a building permit, and receive premium discounts on fire insurance. 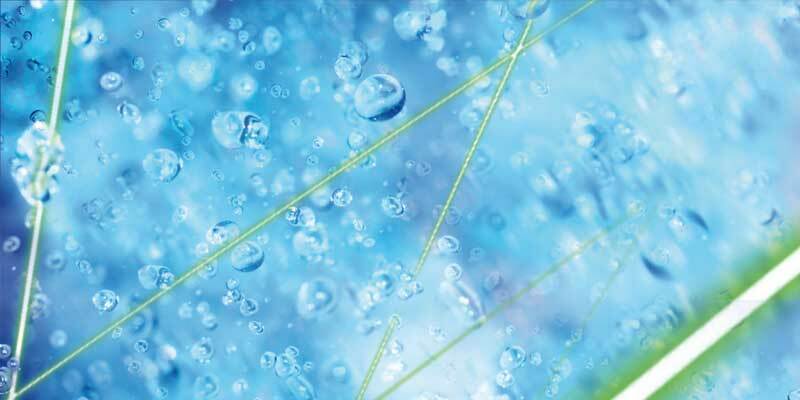 The structure and function of EconAqua™ systems meet the requirements of traditional sprinkler systems. Fine spray sprinklers are installed in the spaces to be protected. In the event of a fire, only those fine spray sprinklers that are located in the immediate vicinity of the fire source open. This enables the fire to be fought immediately with a small amount of finely sprayed water. At the same time internal and external emergency services are alerted. The “EconAqua™” system is recognized and certified by VdS Loss Prevention. High pressure water mist fire extinguishing systems produce a fine water mist with special nozzles at a pressure of about 120 bar. For each application the required nozzle type and therefore the droplet distribution, the flow and the activation can be determined individually, resulting in effective and optimum protection. The water mist binds a large proportion of the rising soot particles, much of the water-soluble fumes can be washed out and the strong cooling effect provides human-compatible temperatures, so this system is ideal for areas with high people traffic. Across the reaction area of the water droplets which is high in relation to the water quantity, large amounts of energy is removed quickly and the temperature is lowered rapidly. Surrounding objects are effectively protected against heat radiation. Additionally, a large amount of the fire’s energy is absorbed by the sudden evaporation of the mist droplets. Simultaneously, the volume of water increases due to the evaporation by 1640-fold, and the oxygen content is reduced in the fire. In opposite to Low Pressure Systems these Effects are maximised to protect very important areas, production-lines or values while a minimum of damage is done by the extinguishing process.